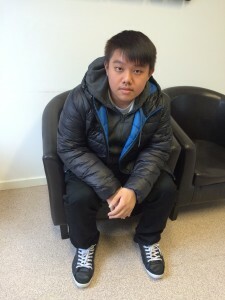 Alex, who is 17 and comes from Malaysia, is studying on our 25 hours English course. We asked him a little bit about himself and how he is getting on at Select English. Hello Alex. Can you tell us about your family? I have a father and mother and one sister, who is older than me. I was at school. My favourite subjects were English and mathematics. And what do you want to do when you finish your English course? I want to study Business at university. Maybe I will help my dad at work. He runs a company which recycles waste paper. Is the UK very different from your home country? Yes, the air is much fresher – and colder! Yes, it’s not too busy. Yes, I have visited London and Bicester with my friends. I go to the library to study and do my homework. How long have you been studying English at Select? I have been here for one month. Because my English is very bad and I want to improve. Yes, the teachers are very friendly.